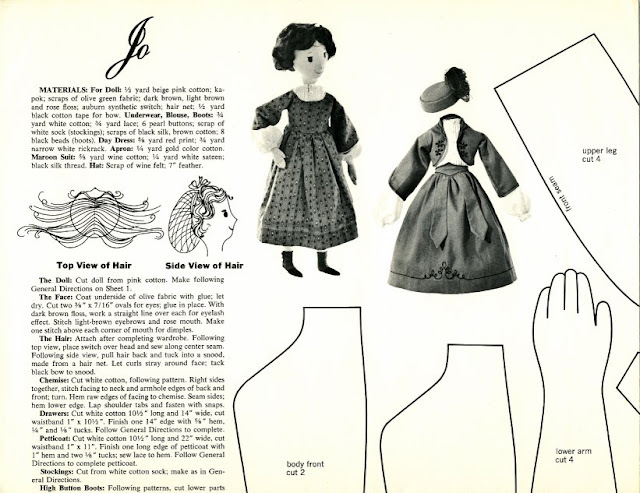 Four patterns to make dolls representing the characters from the classic novel, "Little Women," were issued by Women's Day magazine in November of 1963. The designer, Joan Russell, created many wonderful patterns for Women's Day in the '60s and '70s, but Meg, Jo, Beth and Amy are among her best, in my opinion. What I love most about these dolls is that each doll is an individual, with her own body pattern. 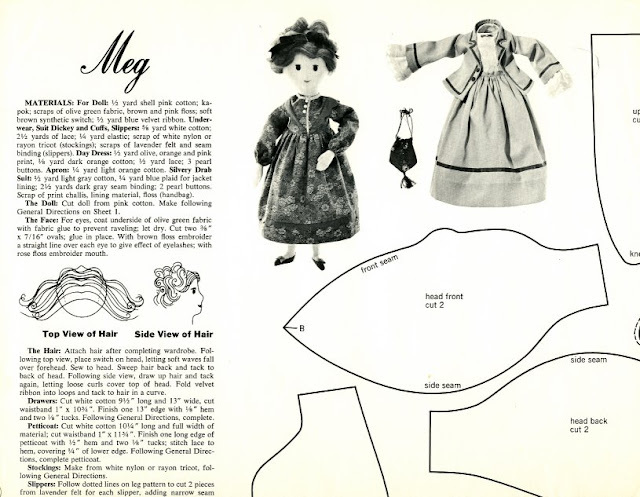 Most mass-produced dolls of the March family girls use the same body, and often the same face for all four sisters, despite the fact that the characters at the beginning of the book range in age from 12 to 16. The patterns are printed on oversized sheets of plain paper. The whole package cost fifty cents. The finished dolls range in height from 17.5" to 20". Their heads and torsos are pieced in quarters, with seams at the front, back, and each side. 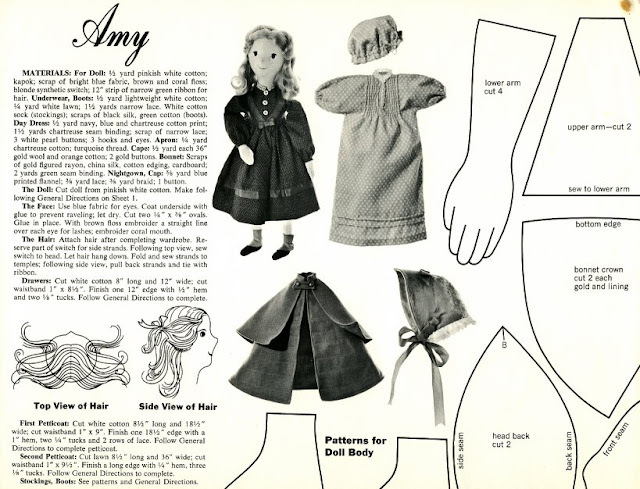 The dolls have stuffed lower arms with stitching to indicate fingers; the upper arms are left unstuffed. 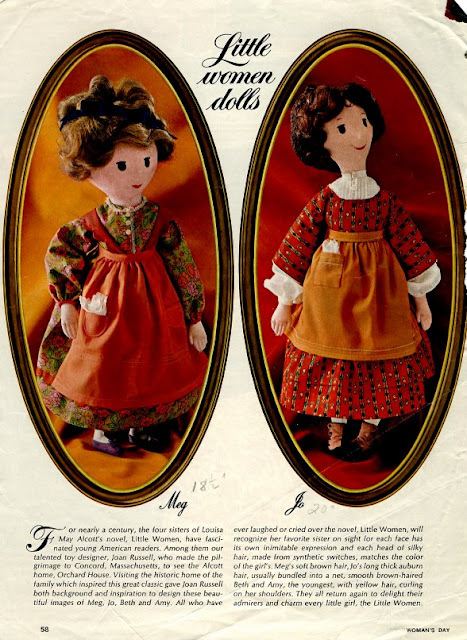 They have embroidered features and synthetic hair. Each doll has two outfits. 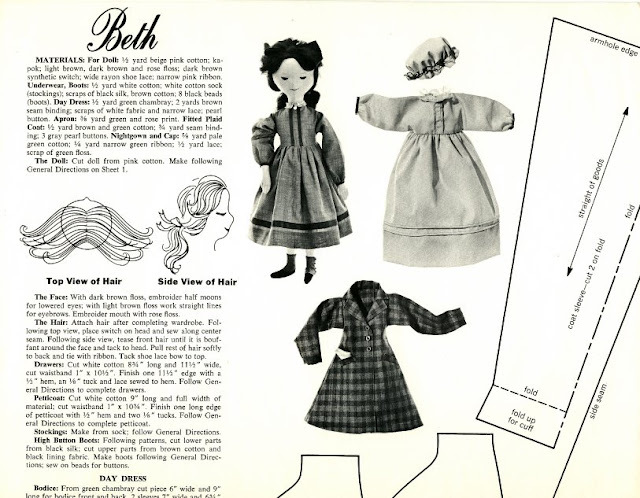 Amy and Beth each have a day dress and a nightgown. Amy has a cape and Beth a coat. Jo and Meg each have a day dress and a suit outfit of jacket, skirt and blouse. There are instructions to make undergarments for each of them. Meg has slippers while her sisters wear boots. Instructions to make wardrobe trunks are also included. 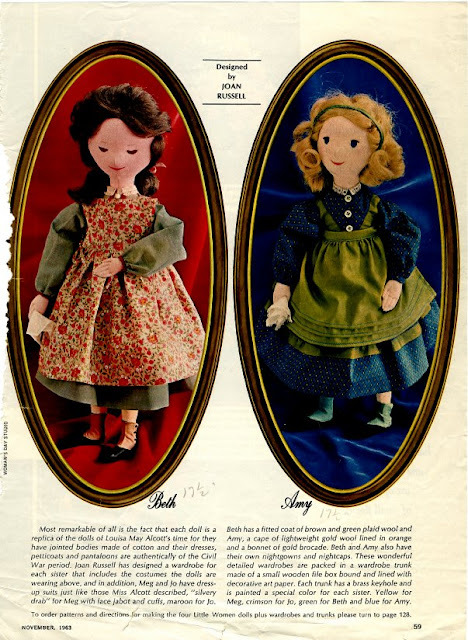 Fairy Tale Doll Patterns from the Marcy St. Doll Co.